Asbestos is a naturally occurring mineral that has been mined and used in thousands of products worldwide. Around the turn of the 20th century, lung scarring caused by asbestos [asbestosis] was recognized in many individuals occupationally exposed. As the century proceeded, thousands of cases of asbestosis, lung cancer and mesothelioma were attributed to asbestos exposure in the workplace, in the environment and in homes. 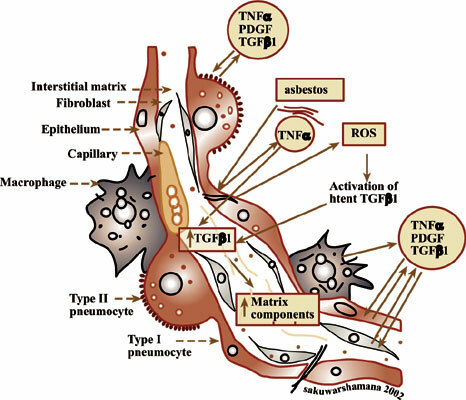 Asbestosis develops when asbestos causes injury to cells at the bronchiolar-alveolar levels of the lung. The injury to epithelial cells and macrophages leads to the up-regulation of genes that control expression of peptide growth factors mediating cell proliferation and elaboration of excess connective tissue [i.e., scarring]. Lung cancer and mesothelioma develop when the carcinogenic asbestos fibers cause abnormalities in sets of genes that control cell division. Asbestos causes genetic errors by binding to chromosomal DNA and by generating Oxygen radicals that mediate the development of mutations. All of the six different asbestos minerals can induce all of the changes indicated above and thus cause asbestosis, lung cancer and mesothelioma. The investigators who are able to determine just which sets of genes are required to be damaged for lung cancer or mesothelioma to form will set the course for the development of effective treatments where now there are none for any of the asbestos-related diseases. DNA damage, fibrosis, inhaled asbestos, lung cancer, lung cells, lung injury, mesothelioma.